Automatic and advanced SAS, R, JMP, Excel statistics. Export reports to Microsoft Word and Microsoft Excel. of small differences in sample stimuli. are not the actual blinding codes that will be shown in your live test. See your Test Definition Rotation Plan. Panelist is presented with three coded samples, two of which are identical. The panelist is asked to pick the sample which is different from the others. then select the one sample which is different from the other two. Result Data Values, the Blinding Code column shows the actual Blinding Code selected by the panelist. Result Data Values, the Sample column shows the Absolute Sample Number of the FIRST(LeftMost) Sample presented as defined in the Rotation Plan Sample Set for this panelist. Use Affective ballot triangle when additional ballot functionality is needed beyond traditional Discrimination. Affective triangle studies also allow for flexible custom sample ordering experimental plans and multiple reps.
Advanced: Automated Triangle Test Blinding Codes from Multiple Pulls. Rotated and *specific* sample multiple blinding codes. AABB 1 Pull, AA BB, utilize exactly *four* unique blinding codes. AAABBB 2 Pulls, AAA BBB, utilize exactly *six* unique blinding codes. AAAABBBB 2 Pulls, AAAA BBBB, utilize exactly *eight* unique blinding codes. AAAAAABBBBBB 3 Pulls, AAAAAA BBBBBB, utilize exactly *twelve* unique blinding codes. Panelist is presented with two coded samples and an identified reference sample. One of the coded samples will be identical to the reference sample. from (or identical to) the reference sample. Rotated - the reference sample is ROTATED between the the two test samples. Constant - the reference sample is always CONSTANT as the control sample. then select the sample which is the same as REF. Both DTR & DTC  Questionnaire 'Seen With' Relative Sample Order 1. Two Choices ( ) 111  ( ) 222. Designs are 2C3. Experimental Plans are DDTR (4 blocks  1 2 1  2 1 2  1 1 2  2 2 1) and DDTC (2 Blocks  1 2 1  1 1 2). Optional:  See Choices Tab to select custom text for No Preference. 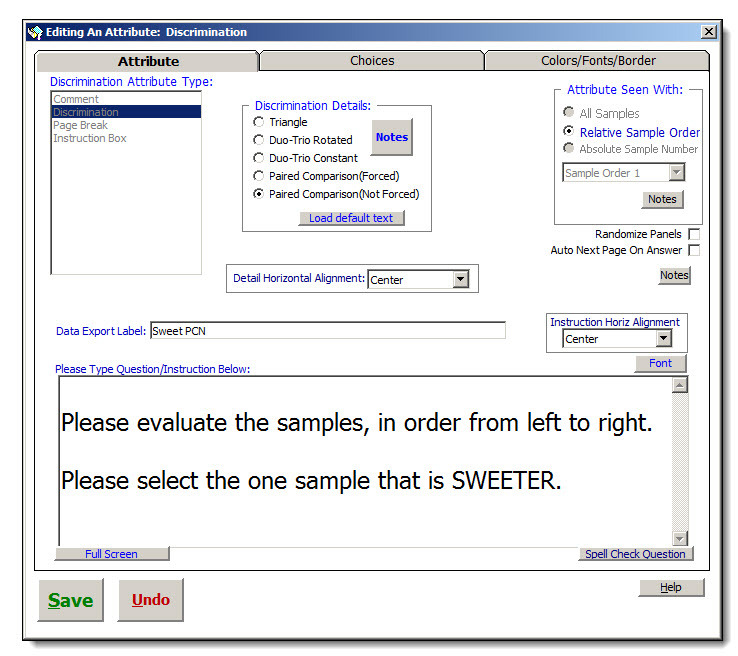 Example: Please select the sample that is sweeter. 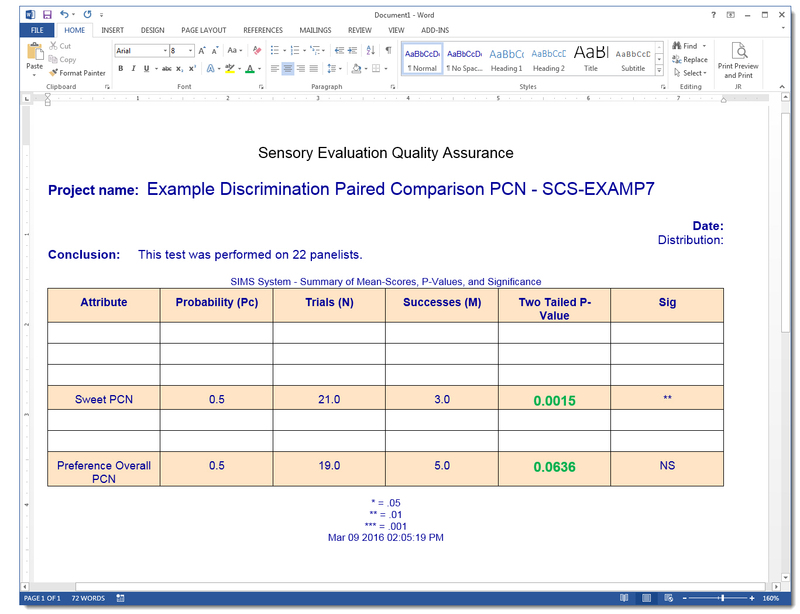 Result Data Response Values for Discrimination Tests (PCN, PCF), the Absolute Sample Number SELECTED by the panelist. Such as Test Data Results Report, Test Raw Data Excel Exporting, etc. - See Statistics areas, Discrimination Binomial Analysis. 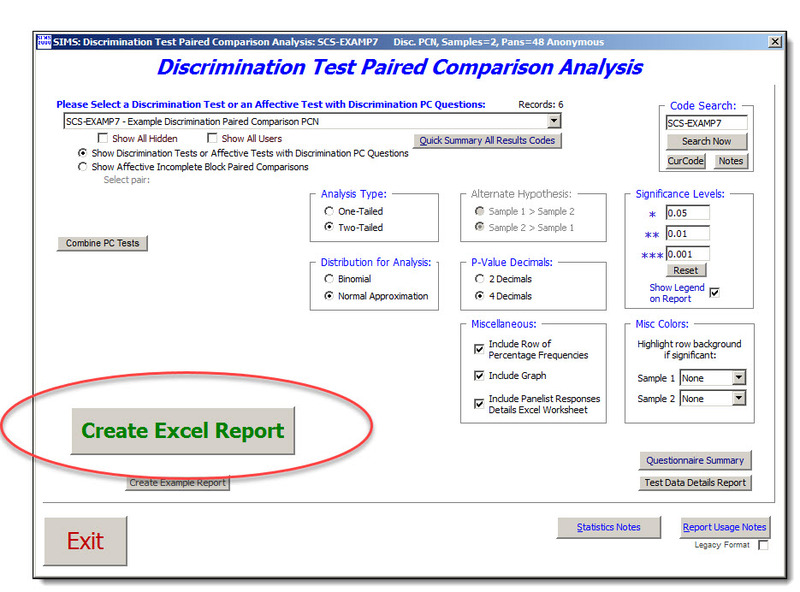 - See Reports dropdown menu, Discrimination Reports, Paired Comparison Attribute Analysis. - See Reports dropdown menu, Raw Data Exporting. 2-AFC (Alternative Forced Choice) is also known as a Paired Comparison Test. 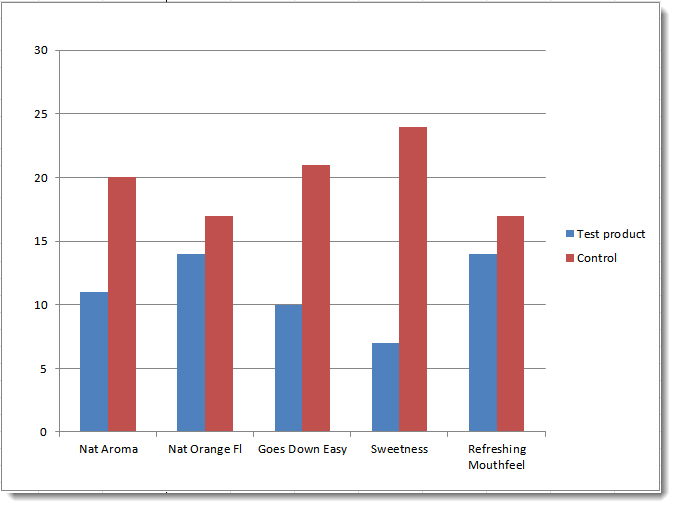 - Use This method to test for sensory differences between two samples, such as 'which sample is sweeter'. - set up your 2-AFC as a Paired Comparison test, with PC or PCN, where an answer is forced or not forced. 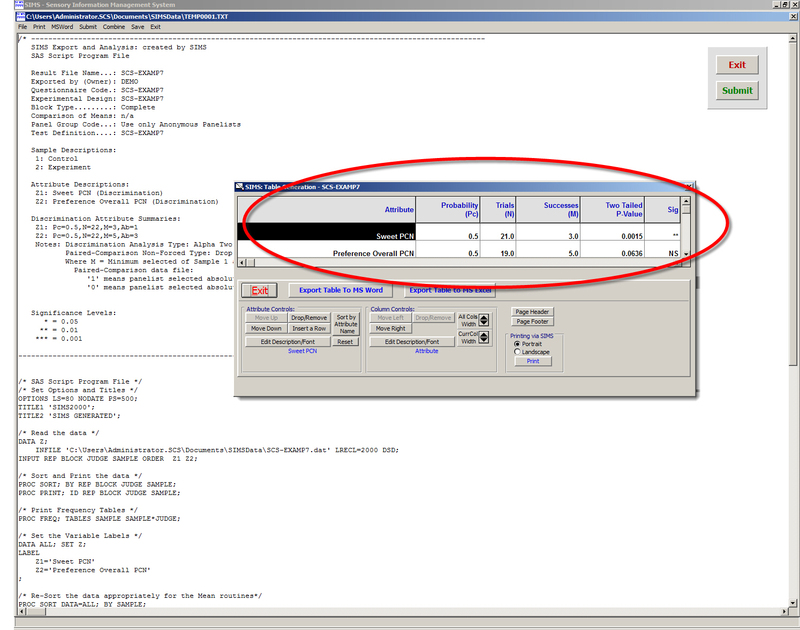 - Same SIMS Paired Comparison Attribute Analysis, in addition to the other available reports. - Reference #1:  Sensory Evaluation Techniques, Civille, 3rd Ed. (pg 100), 2nd Ed. (pg 100). Also commonly referred to as multiple paired comparison, multiple paired preference, pairwise ranking, and incomplete block paired preference. Can not use the typical Discrimination PC since a 2 sample, complete block design is required. Incomplete blocking such as 3C2, 4C2, 5C2, etc.,  when Samples >=3, and presenting only two samples. 1) Ranking; Paired Comparison is similar to Pairwise Ranking. 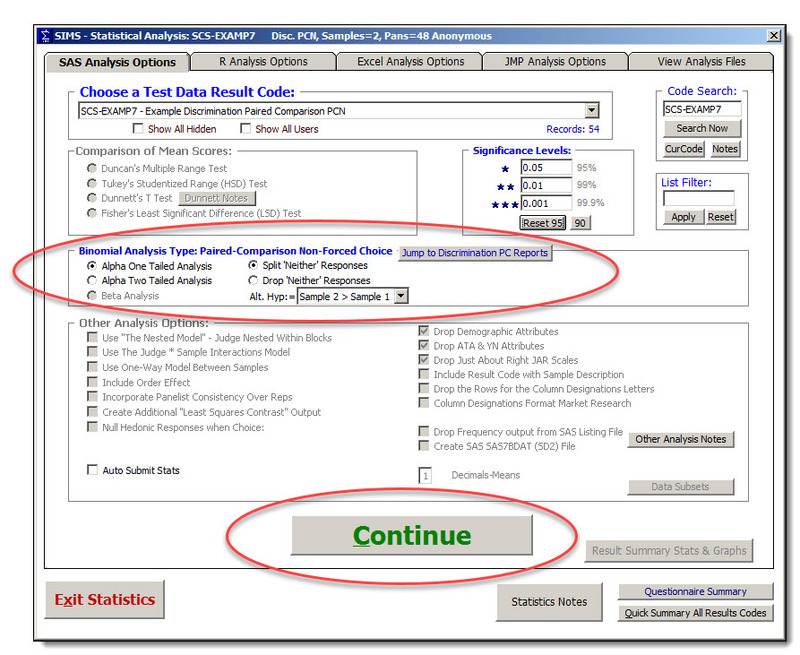 Use an Affective type Questionnaire, SIMS Ranking Attribute question, 'rank all'. 2) Hedonic; using SIMS hedonic attribute type, 'select one'. Set up the ballot as an Affective questionnaire using Hedonic Attributes instead of the typical two sample Discrimination PC. Note: The 'Attribute Seen With:' option should be set to 'Relative Sample -- Last Sample', so that this question is only seen once at the end of the ballot. Note: See Webpage:    http://www.SIMS2000.com/Sample11.asp     for additional and the latest information. or 'Seen With Sample Order 2.' or  'Seen With Last Sample'. be Seen With Sample Order n, where n = 1 or n = 2  or  'Seen With Last Sample'. must be seen with same sample as the Discrimination Attribute. same page as a Discrimination Attribute. Triangle and Duo-trio tests can not be used. Test option, it is fairly easy to set up. describes how to set up a Same/Different Test in SIMS . 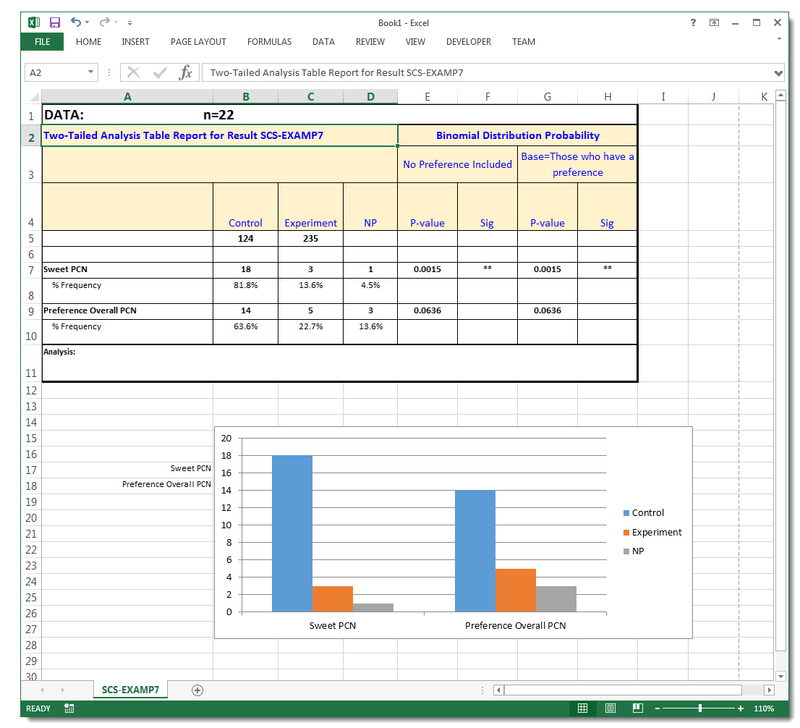 The Excel File is organized in three simple worksheet tabs. 1. TestPreparationNotes, how to quickly setup the test in SIMS . 2. SIMSTestData, how to get your Same/Different data to Excel. Advanced note: Fisher's Exact Test (FET) statistical test of the equality of two independent binomial proportions. - FET vs chi-Square, chi-square calculates aproximation P-value and it more suited to tests where the # of assessors is not sparse, i.e. where all cells expected frequency values is >=5. In many cases the Chi-square is preferred because the Fisher Exact Test is difficult to calculate. - As of this writing SIMS does not automatically calculate FET, please use one of the online calculators, and use our chi-square.xls to get to the 4 cells needed; Matched and Unmatched pairs, and the responses Same and Different. Time needed to setup test in SIMS = 5 minutes. Time needed to export data into Excel Spreadsheet = 3 minutes. Time needed to get to final Chi-Square statistics = 1 minute. and Duo-trio tests can not be used. describes how to set up a A - Not A Test in SIMS . The Excel File is organized in two simple worksheet tabs. and one or more other samples. O      Estimate the degree of such difference(s). Tetrad Test is a discrimination test presenting 4 products to the judge among which 2 are from one group and 2 are from another group. 2A 2B. AABB BBAA ABAB BABA ABBA BAAB, 6 possible presentations, same as Triangle Test. Guess probability is 33%, same as Triangle Test. For the unspecified tetrad test. Unspecified tetrad test vs specified tetrad test. More common type of tetrad test is the unspecified tetrad test. Acccessors are not given any specific instructions about attributes to focus on. Acccessors task is simply to group the products with out regard for order or intensity. Guess probability is 33%, same as Triangle Test. SIMS Reports assume the unspecifed tetrad test. Acccessors are given a specific attribute to focus on. Acccessors task is to group the products in the correct intensity order, usually low to high, week to strong, etc. Guess probability is 17%. Adjust Excel line for 'Probability of a Correct Guess:', and recount correct/incorrect. SIMS Software Express Package file examples are available on the webpage for quick Set up on your SIMS System. 1 Instruction Box for the Group A and Group B Column headings, use <WEBTEXTGRID; Tag for this, copy from examples. 4 Hedonics, 2 choices each, return values 1 and 2 referring to Group A and Group B. Each of the 4 Hedonic export labels  = "Relative Sample Order #" , where # is 1 to 4. Each of the 4 Hedonic questions text = "Sample <RELATIVE_SAMPLE_#_BLINDING_CODE> " , where # is 1 to 4. ONLY ONE TETRAD GROUP OF 4 CAN BE BUILT INTO THE BALLOT AT A TIME. If you need multiple Tetrad groups then please use separate SIMS tests and use Test Linking for the panelist session. Reps, multiple Reps are supported. During your test, SIMS will be able to identify and detect the Tetrad Test page and validate the 2 x 2 responses for Group A & Group B. These guidelines are needed to best handle the new complexity of Tetrad designs and may be adjusted in the future. Stats, same as Triangle Test. Sensory Evaluation Techniques, 4th Edition, by Meilgaard, Civille, and Carr, page 433. Tetrad Report's Panelist Details lines show 'Correct' or 'Incorrect' for each individual panelist. 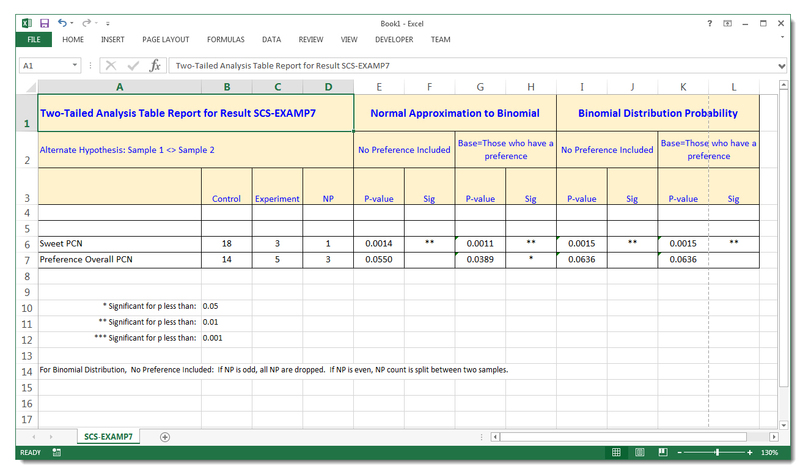 Tetrad Report's S1 S2 S1 S2 = Group #s are shown in the same order required for the Excel Output layout calculations, S1 S2 S1 S2. This order is not necessarily the same as the Test Rotation Plan presentation order. Most other SIMS reports will not provide meaningful information for your Tetrad. The Tetrad Report will show Correct/Incorrect for each participant along with their Group A or Group B responses. and if the report shows n/a and responses for all 4 samples, indicates that the responses are not 2X2 Group A & Group B, which should not happen. Likely your ballot didn't match the detection criteria discussed above. Contact the Sensory Computer Systems support staff and they'll assist. Because this test is a little different than a typical discrimination test, the experimental design will also be a little different in setup. Two samples, four are presented. Setup a 2C4R1 experimental design, with an experimental plan t=2, k=2, b=6, r=1 , where the 6 blocks are: 1) 1122 2) 2211 3) 1212 4) 2121 5) 1221 6) 2112.
Review your Test Rotation plan for accuracy. ASTM Standard E3009-15, developed by Committee E18.04, new standard as of June 2015.